Brad Keselowski clinched a spot in the next round of the NASCAR Chase for the Cup by winning the Geico 500 at Talladega, although four other drivers were not as fortunate and saw their championship dreams come to an end. 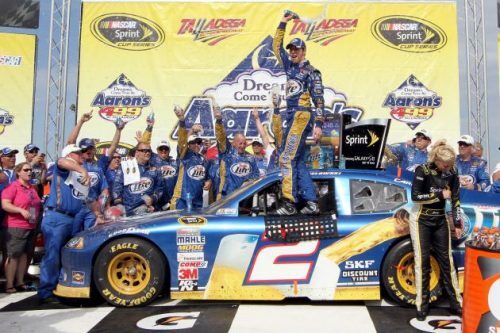 Needing to win to stay alive in the Chase for the Sprint Cup championship, the 2012 Sprint Cup champion came through his series-best sixth victory of the year. The Hendrick Motorsports trio of Jimmie Johnson, Dale Earnhardt Jr. and Kasey Kahne all were eliminated from contention. Kyle Busch could not recover from an early wreck and also was eliminated from the Chase. Brian Vickers earned the pole in qualifying, but this race was wide open from the start. There were a number of lead changes throughout the day.